For 83 years, the Conservation Federation of Missouri (CFM) has led the fight to restore and conserve Missouri’s wildlife and natural resources. Yet, if history has taught us anything, it is that our work is never complete. Each new year brings different challenges. CFM needs your support as we prepare to continue to work for you in 2019. Please help us protect Missouri’s outdoors with your end of the year donation. Your donation will help us with our mission, to ensure conservation of Missouri’s wildlife and natural resources, and preservation of our state’s rich outdoor heritage through advocacy, education and partnerships. In 2019, CFM will continue to raise awareness by holding Explore the Outdoors events in four cities. 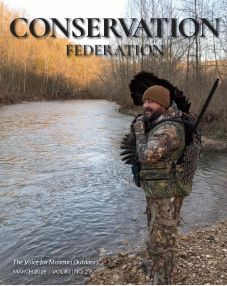 CFM will continue to raise awareness of conservation issues and concerns across our state through different media outlets including social media, podcasts, press releases and our magazine. We will work diligently with the Missouri Legislature to help educate elected officials in their decision to support conservation, natural resources and our parks. As a sincere token of our appreciation, you can receive the travel mug with your donation of $100 or more. When considering how much to give, please remember the Conservation Federation of Missouri stands between you and the many special interest groups willing and able to destroy Missouri’s magnificent natural resources that we all cherish. CFM is proud to serve as “The Voice for Missouri Outdoors.” Thank you for your donation and for being a friend of conservation.